The Journal of Hugh Campbell, Part XIII: Almost There! The passengers and crew get some more food and a dose of good news. At sea everything attracts attention that varies the monotony of the surrounding expanse. A shoal of porpoises, Grampuses, flying fish or a shark was sure to excite lively sensations for the moment. But if a solitary sail was seen gliding along the edge of the horizon our deck would be crowded with the passengers. How interesting to them, this fragment of a world hastening to rejoin the great mass of existence! And what a variety of curious suppositions on the subject!! Almost every day we came in sight of 2 or 3 vessels but spoke not more than 4.
remaining about 2 hours with them, our Capt. returned with a supply of rum, lime juice, oranges, sugar, pork and biscuit. As we approached the land the Capt. began to put things in a train for entering port. 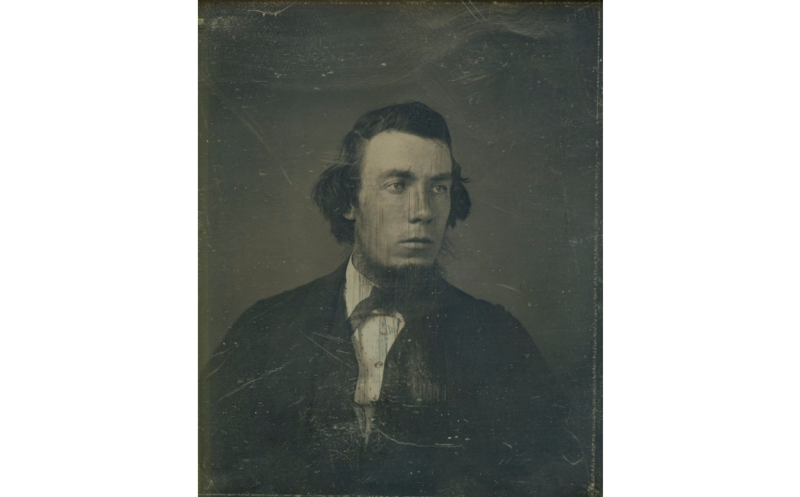 He engaged me to settle his accounts with the sailors and make out manifests and other papers to be handed in to the Custom House on his arrival. I was thus employed every day until we came in sight of land and everything was in the best train I was capable of putting it when we came to anchor. The Capt. was highly pleased with everything and the crew were very well contented with the state of their accounts. 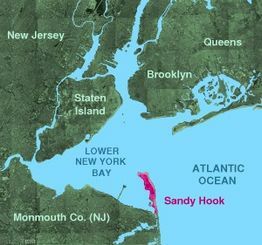 * Sandy Hook is a large land spit in New Jersey at the mouth of Lower New York Bay. The Journal of Hugh Campbell, Part XII: Where’s the Beef? Things are starting to look dire. The Perseverance has been sailing for two months and they still haven’t seen land. The crew is starting to encounter lousy weather, and worse, the ship is running short on food. We were now in the Gulf Stream and this current retarded our progress very much. This stream rises at the mouth of the river La Plata, South America, increases in rapidity passing through the Gulf of Mexico until it reaches the Gulf of Florida from which it takes its name. Here it runs at the rate of 8 miles an hour. From this it runs along the American coast below the Bank of Newfoundland and loses itself in the North Atlantic Ocean. We crossed it in Lat. 40 degrees where it runs 2-1/2 miles an hour, consequently our progress was slow. 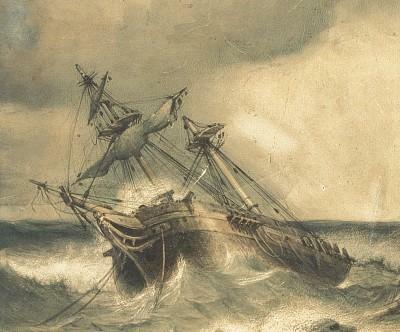 Emigrant ship during a storm. Great quantities of gulls were seen floating hereabouts. Here we experienced the greatest thunderstorms I ever witnessed. The rain fell in astonishing quantities and we took advantage of this to add to our supply of fresh water by collecting all that fell on deck. I suppose that the great evaporation from this stream warmed by a southern sun causes these uncommon and frequent rains. We had now been upwards of 60 days from land and no sign of approaching our destined harbour. Provisions began to get scarce. Water was nearly done and coal very scarce. The old proverb of “Empty mangers make biting horses,” was verified to a certainty. Some said that the Capt. was going to the Devil for all they knew as they were sure he had lost his reckoning and others swore that we would be obliged to eat our shoes before we seen land again. Our murmuring increased daily especially while the wind was contrary. But when it turned fair all was well as long as it continued so. Thus did our ignorant, ungrateful passengers annoy the Capt. by their idle and useless murmurs. To quiet them, I have often known him to divide his own cabin stores with them.